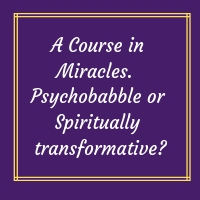 What exactly is “A Course in Miracles”? It is a book that was written in 1976 aiming to teach about spiritual transformation. The main premise is that teachings reach us in the timeframe and format that speaks to us that is relevant and right for us. You can actually find it freely online as a PDF or in a bound version sold by Amazon. Alan Cohen (an inspirational spiritual teacher) wrote a version of his own entitled “A Course in Miracles Made Easy” available on both Audible and in written format. (Alan has the most resonant American voice that is extremely easy to listen to!). The book has been called everything from New Age Psychobabble to a Satanic Seduction to New Age Bible. Essentially the book talks about two basic premises within the Human Condition: Fear and Love. Do we come from a place of FEAR or LOVE? For example as a self employed therapist, should I opt to give up my trade and my passion in order to take a full time job I may be operating out of FEAR that I cannot make this work. If I follow my passion, after training for tens of years then I may be coming from a base of LOVE and trusting the Universe has my back. This is another book by Gabrielle Bernstein, also available on Amazon and Amazon Audible. It is always a question of deciding WHAT one does actually WANT and being clear about the feelings associated with that and trusting the universe will deliver. This may have a “law of attraction” aura about it however I am aware that this does actually work as long as we can be clear about desires. No matter what your feelings on your passion and whether or not the universe does have your back or not, the books are inspirational and worth reading or listening to.